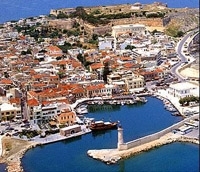 Rethymnon, the capital of the prefecture of Rethymno, is a lovely town with a sandy beach 12 km. Visit the old town, the imposing Venetian castle Fortezza, the Venetian old harbor, the city market, and the old town. Offers a port, marina, bus station and shops - services of all kinds. Please contact us for available hotels at this location.